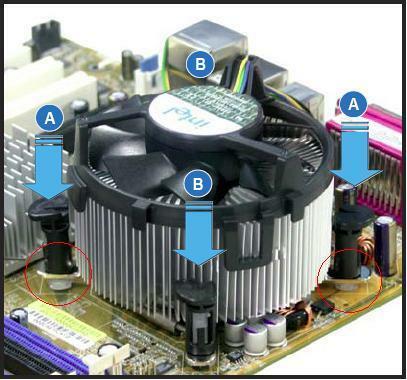 of the stock Intel heatsink/fan unit ("HSF"). translates directly into higher CPU temps. contact pressure with the top of the CPU chip. on the fan housing directly above each push pin. 140 F. to 100 F., which helped isolate the problem. on recent high-end ASUS LGA-775 motherboards. inside the red circle on the right. lot of downward pressure on each one. thermal paste) -- NO OOZING PLEASE!! are reported formally to your supplier.